There’s no doubt that the “come and take it” attitude of the people of Gonzales County makes this an area worthy of notice. Both history and modern society culminate here with a beautiful rolling countryside as well as performances and exhibits featured in the cities. When it comes to land development, for our commercial land developer clients as well as our local homesteaders, attention is paid to detail. 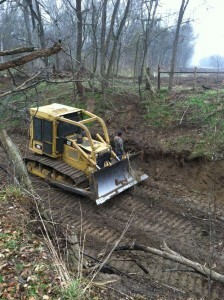 We specialize in land clearing, and site work, including septic installation. You don’t have to search for excavating contractors and underground utility contractors- we have the experience and the drive to get things done. There’s no such thing as good enough coming out of the birthplace of Texas independence. Our team at Graham Construction & Land Clearing share this philosophy and apply it to every project we work on. When you’re thinking about further developing your property, don’t settle for subpar- it should always add value to the land. Whether you are looking for extra storage for your property, need a barn for your animals, want to increase the value of the land by adding structures, or want to install an area that can host family and friends for entertainment, we can provide you the right cover. Customized metal buildings will take care of your needs, whatever they may be. When we build a structure for you, we only provide the best so you can use your time on something other than worrying about the quality of construction. Obtaining quality ranch fencing in Gonzales County has never been easier. When we install fences and gates on your property, we make sure that they’ll do the job you need done. We can install gates and metal fencing as well as help with cattle penning. If you’re looking for something to mark your property lines and look good while doing it, we offer the finest in wood ranch fencing, sure to give your land that special touch. Before land development projects can begin, land clearing is often necessary. Trees and brush that aren’t removed properly the first time are likely to come back and haunt you later down the road. From Pecans to Cypress and all other Texas native or invasive trees and shrub, we’re the experts that will make sure vegetation is removed correctly so you won’t have to spend extra dollars doing the same land clearing job later. Hunting in Gonzales County is a favorite local pastime. If you have a hunting lease, you’ll no doubt be looking forward to getting a few deer, hogs, or wild turkeys populating the area, and having assistance with your wildlife management can make all the difference. Food plots, water features, game-proofing systems, fishing and waterfowl ponds are all excellent options to enhance your land as well as your experiences. Site work is always in need on any multiple acre plot in Texas. While developing the land, finding underground utility contractors and excavating contractors shouldn’t be an issue- we handle this and more. Building roads and access points and leveling and grading areas of your property are often required with most site work projects. Don’t let an overgrown plot decrease the value of your land- we have the tools and know how to make sure site work is done correctly from the get go. Septic installation can also be difficult when going at it alone due to the diversity of Texas landscape and the red tape you have to navigate. No matter what your land needs are, chances are we at Graham Construction & Land Clearing have the expert knowledge to help you do it. From ranch fencing to septic installation, metal building design and installation, sitework and everything in between, our long history of serving Gonzales County makes us the right partners for you.